The Ten Names Of God were used to attract the virtues and powers they represent, or to accomplish some desire signified. The first is the name Eheia, the essence of Divinity, influencing the angelic order of Seraphim through whom the gift of being is bestowed on all things. The second is Jod, signifying wisdom, ruling through the order of Cherubim. The third is Elohim, signifying providence and understanding, ruling through the order of Thrones. The fourth is El, signifying clemency and goodness, grace, piety, and magnificence, ruling through the order of Dominions. The fifth name is Elohim Gibor, signifying power and judgment, ruling through the Seraphim. The sixth name is Eloha, meaning Beauty and Glory, and has power through the order of Virtues. The seventh name is Adonai Sabaoth, the God of Hosts, triumph and victory, justice and eternity, ruling through the order of Principalities. The eighth is Elohim Sabaoth, signifying Piety and Agreement, ruling through the Archangels. The ninth is called Sadai, that is, Omnipotent, and has influence through the Cherubim, ruling the increase and decrease of all things. The tenth name is Adonai Melech, signifying Kingdom and Empire, and has rule through the Blessed Souls giving knowledge and understanding. 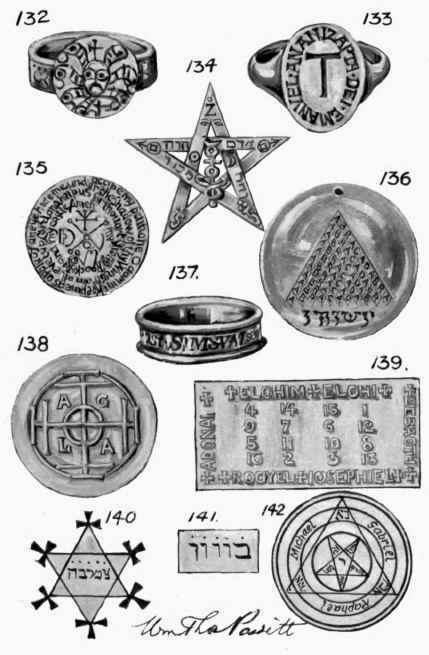 Names of power were compounded from letters taken from verses of Scripture: for example, the Agla is formed from the initial letters of the words Ate Gebir Leilam Adonai - "Thou art mighty for ever, O Lord"; a popular charm during the fourteenth century against Fever, frequently found on rings and brooches of this period. It was used by Dr. Dee, as illustrated on Plate X, Illustration No. 138.